In deBlasio's 2013 campaign there were implicit promises made regarding police reform and an implicit promise with Dante deBlasio being the face of the most effective campaign ad, that Bill deBlasio would be a mayor that understands and empathize with people of color. 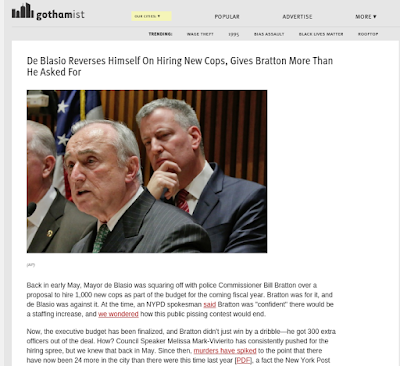 His recent turn around on policing and a double down on Commissioner Bratton's and PBA President Pat Lynch's desire to turn the city's open society (nearly anarchistic culture) into a police state with unchallengeable and criticism-free police officers. In a democratic and free society, the individuals not only has a right to challenge authorities but an obligation to constructively criticize authority and those that implement the policies that were supposed to the will of the people in the first place. If the people demand that the local constables harrass and bully their youth, then constables should follow that course. On the other hand if the only the privileged want the unprivileged to be harassed indiscriminately the unprivileged have the right to redressed their concerns to their government through their elected representatives, which is the intrinsic campaign promise deBlasio ran and won with in 2013.
deBlasio may be campaigning nationally on a income inequality message, but this most recent reversal is undercutting whatever progressive cred he may have had as a candidate. I would also want to remind everyone that it was deBlasio and his campaign manager Emma Wolfe that strong armed robbed the WFP nomination on behest of Cuomo despite never intending to hold Cuomo to his promise to deliver the State Senate back into Democratic control; as Cuomo had already promised Senate Majority leader that he would retain the Senate chamber.